Unfair trading practices such as dumping and the granting of subsidies have long been identified as threats to open markets. Yet despite decades of international trading rules, global markets are still jeopardized by practices which can cause material injury to industries and put employment at risk. The European Union has been a leader in its determination to ensure that its industries are not disadvantaged by such practices, that Community interests are defended, and that fair competition is restored where needed. Throughout the presentation the author describes relevant cases and actual measures taken. Tables of cases and measures as well as a bibliography are included. Business people and their counsel, whether engaged in trade within the EU or between any country and an EU Member State, will benefit enormously from the detailed guidance offered in this incomparable volume. The book will also be invaluable to academics and policymakers as an unclouded analysis of anti-dumping/anti-subsidies procedures under EC law. I. Introduction. II. Substantial Issues of Dumping and Subsidies. A. Basic Principles Regarding Dumping and Subsidies. B. Definition of a Subsidy Countervailable and Non-Countervailable Subsidies. C. Calculation of Dumping and Countervailable Subsidies. D. Determination of Injury. E. Definition of Community Industry. F. Sampling. III. Procedural Issues of Dumping and Subsidies. 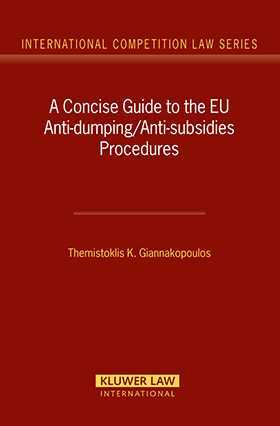 A. Initiation of an Anti-Dumping/Anti-Subsidies Procedure: The Filing of a Complaint. B. The Procedure Following the Initiating of Proceedings. IV. The Outcome of Anti-Dumping/Anti-Subsidies Investigations. A. Imposition of Provisional Measures by the Commission. B. Termination of Investigation by Acceptance of Undertakings by the Commission. C. Termination of the Proceedings Without Measures Imposition of Definitive Duties by the Commission. D. Duration of Measures Reviews. E. Refunds. F. Absorption of Measures. G. Circumvention of Measures. H. Suspension of Measures. I. General Provisions Publication of Measures Consultations. V. Judicial Review of the Various Commission Decisions in Anti-Dumping/Anti-Subsidies Cases. A. Action for Annulment: Challengeable Acts and the Locus Standi of the Interested Persons. B. Actions for Failure to Act¿Actions for Damages. Case Law of the European Courts. Community Institutions Acts Imposing Measures. Indicative Bibliography.